Located in the Apennines hills, you will taste a very good olive oil visiting the town of Leivi during your holiday in Liguria, Italy. There are different hypotheses, which attempt to explain the origin of Leivi. One of them, which seems to enjoy general acceptance is that the town derives its name from an old Ligurian tribe, the Laevi. This tribe lived in the pre-Roman era and extended its influence up to the Tyrrhenian Sea. At that time the settlements were being used for business purposes at the “bridgehead”, not far from the sea. One other very interesting thing is the path of the five towers. This path already begins in Chiavari, goes round Leivi and past the bell towers of 4 churches, i.e. St. Tommaso del Curlo, St. Bartolomeo, St. Rufino and St. Lorenzo, as well as past a medieval tower. This path is very well marked and not very challenging. Therefore both old and young visitors will get an insight into Liguria’s natural environment and enjoy the wonderful sights. A walk through the streets of Leivi also opens up very new insights. At the moment one has a view of the church and the mountains lying in the background, and in the next moment it is an excellent view of the peninsular of Portofino which opens up. In the same way one can see the Zatta mountain, Stift, Aiona, Ramaceto Caucasus and the peninsular of Sestri Levante. In Leivi one can spend one’s vacation in green surroundings, far away from the noise of the town. One can enjoy fresh air, healthy natural environment, and quiet sleep, without being far from the sea. 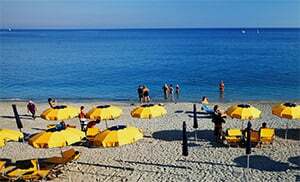 In just a few minutes one is back in tourist life, and can enjoy the day on the sandy beach of Chiavari. Leivi lies behind Chiavari, at the foot of the Ligurian Apennines. It is surrounded by Olive groves and lies in the lower Fontanabuona valley, 41 Kilometres from Genoa. Today Leivi represents one of the most beautiful and best maintained examples of scattered settlements. Surrounded by silver glimmering olive trees, Leivi lies right in the middle of olive groves. The olive oil produced in Leivi is excellent and because of that, a feast of olive oil is celebrated there every year. villages near Leivi, for example: San Colombano (7.6 km), Cerisola (15 km) and Carasco (5 km). When coming from Genoa, take the highway exit to Chiavari and then follow the SP32 past Rostio and Crocetta up to Leivi.